Seattle friends, family, and fashionistas! It's time to RSVP for exclusive access to Style Up! 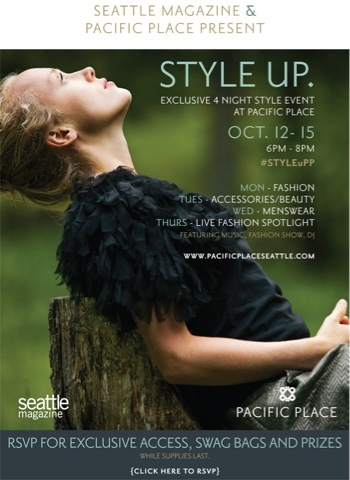 A week of fall fashion and lifestyle events, October 12-15, 2015 at Pacific Place presented by Seattle Magazine and Pacific Place. On Monday October 12, I'll be joining other influential Seattle style bloggers for the Seattle Fashion Bloggers STYLE UP Pacific Place Retailers Event. From 6pm - 8pm I'll be styling and hanging out at Farinaz Taghavi at Pacific Place. I would absolutely love for you to stop by and say hi! Click Here for More Information about Style Up from Seattle Magazine. Click Here to RSVP for Style Up individual events, exclusive access, swag bags and more!